Whether it’s a blog-turned-book-turned-movie like Julie & Julia, an article on eating with a conscience in the New York Times, or a family recipe passed down through generations, food writing is everywhere and it’s constantly adapting to evolving palates, publishing trends, and technologies. 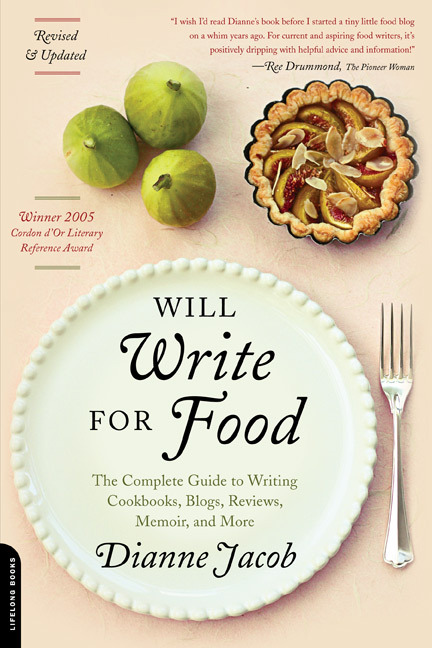 In the newly revised and updated edition of Will Write for Food, I cover the most popular genres of food writing including: cookbooks, recipes, memoir, fiction, culinary travel, restaurant reviews, and a large new chapter on food blogging—a phenomenon now reaching millions of readers. Chapters, complete with skill exercises, cover everything from freelancing and writing pitch letters to constructing the perfect cookbook and enhancing blog posts with photography. "An engaging, informative handbook for hobbyists and aspiring professionals. Worth purchasing even if you have the first edition." Chapter 1: What, Exactly, Is Food Writing? Based on my own experiences as a blogger, cookbook co-author, freelance writer and former magazine editor, the book also contains interviews with seventy-five of the country’s most successful food writers, literary agents, cookbook editors, and recipe developers. I reveal what kind of food writing is working now and why. Featuring generous strategic advice and “break into the business” stories from award-winning writers like cookbook author Mark Bittman, former Gourmet editor Ruth Reichl, and Los Angeles Times Food Editor Russ Parsons, Will Write for Food provides an essential tool for every foodie hoping to put pen to page—or hands to keyboard. Please support your independent book store, or order at Amazon.com. "I wish I'd read Dianne's book before I started a tiny little food blog on a whim years ago. For current and aspiring food writers, it's positively dropping with helpful advise and information." "A thorough tour through the increasingly dense jungle of the business of food writing. Dianne's bok will prove invaluable to all writers who want a new or bigger audience for their work, whether in digital form, in blogs, in magazines, in cookboks, or in food memoir." "Considering today's food-writing labrynth, Will Write for Food leads writers to success, step by step. It's a must on my can't-do-without bookshelf and a resource I always recommend to food writers." Until now, the only way to eat a gourmet pizza with a crispy, smoky crust was to order it in a restaurant. Today you can achieve the same flavor and texture by grilling it in the backyard. All you need is a grill and a spatula to create mouth-watering pizza for families or a crowd. 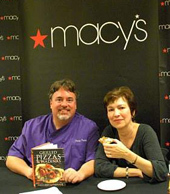 Chicago magazine calls my co-author Chef Craig Priebe a “pizza miracle worker.” He has been grilling for 12 years and now, with my help, brings his culinary creativity and seductive ingredient combinations from around the globe into the home kitchen. Try a jerk-smoked pork pizza with plum chutney and mango, or a grilled eggplant piadina with a tomato vinaigrette. What's a piadina? It's a crispy grilled flatbread, folded in half and filled with ingredients such as pancetta, arugula and tomato. For a terrific exploration of piadinas, read this newspaper feature. Watch Craig make the Emilian on TV: a proscuitto, Gorgonzola and sage grilled pizza with cantaloupe chutney.